Find international call rates for mobile devices at PhonePower. International Calling 60 Min/Mo - Free! (View Countries) 60 Min/Mo - Free! Keep Current Phone Number for FREE! The Bottom Line... what does it cost? Based on selection of our standard VoIP Adapter. *The Regulatory Recovery Fee is $35.64 a year per PhonePower primary phone number. It is a fee that PhonePower charges its customers for but not limited to local number portability costs, CALEA compliance costs and other regulatory related fees and cost. The Regulatory Recovery Fee also includes similar cost incurred in foreign countries. Want to lock in $9.95 a month for phone service for an entire year? Then you've come to the right place! *The Regulatory Recovery Fee is $2.97 per PhonePower primary phone number. It is a fee that PhonePower charges its customers for but not limited to local number portability costs, CALEA compliance costs and other regulatory related fees and cost. The Regulatory Recovery Fee also includes similar cost incurred in foreign countries. Want phone service without a contract or prepay for $19.95 a month? You got it! All basic and advanced features included free. Calls to other PhonePower users, even in other countries, are always free. Calls to many mobile phone numbers are included (see above for included countries). Use the PhonePower online Account Portal to check voicemail and personalize features. Which rate plan would you like? PhonePower is a next-generation telecommunications company, headquartered in the United States. We provide telecommunications service to the continental US, and Canada. Our award winning customer support is based in the United States (not overseas). PhonePower provides phone service to single-line residential customers all the way to large corporate call centers. Big or small, we have a phone plan to meet your needs. Sure! With the iPhone and Android Apps, you can now take your PhonePower VoIP Phone Service with you on the go and never be without access to your home phone number or miss an important call! Enjoy all the benefits of your service at home...away from home! + Can I connect multiple phones around the house with PhonePower? Of course! You can have your phones upstairs, downstairs, all over the house. As long as you use a cordless handset phone system like most homes do. All you need to do is plug the base unit into your PhonePower Adapter, and all of the other handset phones will work perfectly. + Can I send faxes with my PhonePower service? Sure. PhonePower fully supports fax. All you need is a high-speed internet connection (Cable, DSL or Fiber Optic) and a phone. You don’t even need a computer. We will send you the PhonePower adapter via the mail. Just plug it into your Router, then plug in your phone, and you’re ready to go. + What are all of the PhonePower features that I will get with this plan? + Can I use my current phones? Sure, as long as it's a single line analog touch tone phone. + Can I keep my current phone number? + Will I still have 911 service? PhonePower uses VOIP Technology. VOIP (Voice Over Internet Protocol) takes analog audio signals from your phone and turns them into digital data, and transfers them over the Internet. Not a tech nerd? Don’t worry. It will be seamless for you. Just let our technology do the work. Just talk away and enjoy the savings! Yes! In the US there are more than 32 million VOIP subscribers and growing. It is one of the fastest growing technologies today. Something your current landline phone company doesn’t want you to know. + Will making or receiving calls be any different? You won’t know the difference. In fact, most people forget that they changed to PhonePower, only to be reminded when they get the reduced bill. + I’m not tech savvy. Is it hard to set up? Setting up PhonePower is fast and easy. First we send you the PhonePower adapter, next just plug it into your router, then connect any phone, and you’re ready to make and receive phone calls. + How do I cancel my PhonePower service? Block calls from specific numbers and more. Forward calls to any number during an internet outage. Never miss a call, route calls to multiple numbers. Unlimited calling to the countries in your plan. Wonder what it would be like to make mobile international calls without worrying about high calling rates? Well stop wondering! The PhonePower Mobile App makes it easy to keep in touch with your friends and family around the world. Stay connected even when you are on the go. Not only do you save money, but you also get many features that you never knew you could get with your home phone calling plan. Just click on any feature below for details. Get a Free Second Line to make or receive calls using the same phone number! PhonePower VoiceMail Viewer allows you to view and listen to your voicemails through your My Account portal. As simple as looking at your email! This feature allows you to configure and manage many aspects of your service (view bills & payments, recent call logs, configure VM to email options, Remote Click2Call and more). Route incoming calls to specific destinations. See the name and number of an incoming call, while you are on another call. Forgot your phone or traveling & don't want to use your cell phone minutes? Our Softphone allows you to take your features & rates with you, no matter where in the world you are! Make & receive calls or check your voicemail at no additional cost to you! Download it now by logging into MyAccount. Enhanced 911, also referred to as E911, works just like regular 911 with an added safety feature. It automatically sends vital information such as your name, address and the geographical location even if you are unable to speak. With our 30 Day Satisfaction Guarantee, you may upgrade or downgrade to any of our current promotional rates or cancel your plan with absolutely no hassle. If cancelling, simply contact customer service requesting cancellation, return the hardware to us and a full refund will be issued. Customer only bears the cost of return shipping and any usage-based calls (example: Operator or International calls). Money back guarantee is not applicable on unsupported internet services. Experiencing bandwidth issues? Bandwidth Saver reduces the amount of bandwidth our services use by two-thirds. Need to dig a ditch or install a pool? When you call, your local public information center will tell your local utility companies to mark your area's underground pipes and lines. Stay safe and save time before you start digging! Don't want to run the risk of international call charges showing up on your phone bill? With PhonePower International Call Block, you're in complete control of your phone bill. 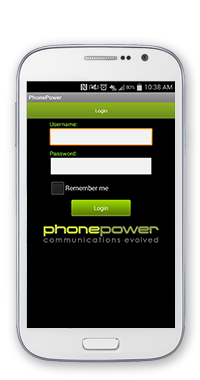 With the PhonePower iPhone App you can now take your PhonePower VoIP Phone Service with you on the go and never be without access to your home phone number or miss an important call! Enjoy your free minutes, international calling rates & added features while you're on the go! FREE DOWNLOAD available on the iPhone App Store. Need information about local traffic or road weather conditions? Calling 511 in supported areas will provide current information about local traffic incidents, closures, weather, and other important roadway conditions. Every PhonePower plan comes with 60 FREE international calling minutes per month to select countries. With Voicemail-to-Email, a copy of every voicemail message is sent to an email address you specify. Check your messages from any phone at any time free of charge. Waiting for a call that's too important to miss? Don't put your life on hold. Simultaneous Ring rings multiple numbers at once to find you no matter where you are. It can be used in conjunction with the Call Hunt feature and is also part of Find Me Follow Me. Easily dial frequently called numbers using a 1 or 2-digit code. With PhonePower Directory Assistance Call Block, you don't have to worry about additional charges showing up on your phone bill. Also, with Directory Assistance Block, you're the one deciding when to pay the service for a phone number. The best feature for friends and family, PhonePower's Free In-Network Calling provides you unrestricted calling time to anyone inside the PhonePower network nationwide or in Canada! Don't miss any calls during or after your move. Simply take your hardware with you & replug into a broadband-enabled line. You can even take your hardware and PhonePower number overseas to International locations! Don't forget to update your 911 information by logging on to your Online Account. Need help finding community services you and your family need in life? PhonePower's simple 211 Community Service Calling allows you to find reputable afterschool programs or specialized care for your mom. From childcare to assisted living, 211 Calling connects you with the services you're looking for. Take the hassle of dialing out of the equation when you're using your online MyAccount portal. Simply click on any number in your contact list to immediately dial that party. The PhonePower Switch will call your PhonePower phone number, then connect the call to the other party. Expecting a fax on your PhonePower Phone line? No problem! With our Fax Catcher feature, you can let your incoming faxes go to voicemail where they will be collected as a file you can open, view and print through your MyAccount portal. 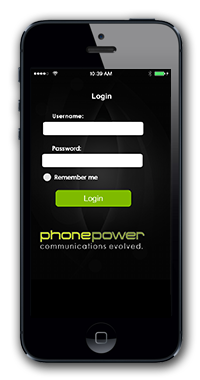 PhonePower offers a mobile-friendly My Account portal. This site can be found at https://mobi.phonepower.com. Want to receive a email when someone calls you? With Call Notifications, you can receive an email notification when a specific number calls your PhonePower number, even if you aren't there to take the call. Check your VoiceMail via phone, web or email with the touch of a button. PhonePower's VoiceMail feature allows callers to leave a voicemail message if you have missed or screened their call. Phone logs are available for real time viewing via your web-based account. Avoid unwanted calls by choosing to reject anonymous incoming calls. Call Forwarding includes International Call Forwarding so you can forward your calls to any number around the world! Don't miss another call no matter where are you are! Allows you to manage your contact list, edit incoming Call Log names and assign Speed Dial codes all from your MyAccount portal. PhonePower is putting you back in control. With Operator Call Block you don't have to worry about unexpected charges on your phone bill. We believe that how you use your optional features should be decided by you. BYOD access lets you use any SIP enabled device on our approved devices list in conjunction with our service. Refer a friend and both of you will receive a $10.00 credit! Plus, all in-network calls are UNLIMITED and always FREE. All they have to do is enter your PhonePower User Name into the Promotion Code area when they sign up at www.phonepower.com. Have you tried calling your phone service provider on the weekends or after work? At PhonePower, our award-winning customer service is available to you when you need us - even if it's on a Sunday. You can call us 7 days a week at 1-888-60-POWER (1-888-607-6937). Need your garbage pickup schedule? Want to report a neighborhood disturbance? Just place a 311 call to be connected with your local public information center for helpful responses to all of your community-related concerns. Make calls away from home or from your mobile phone. With Remote Click2Call, you can connect a call to your PhonePower number and another number for the best international rates, or to appear to be calling from your PhonePower number (if it's an office line, for example). Automatically forwards all calls to a designated number in the event you experience an internet or power outage. PhonePower maintains one of the industries' best self help systems. Our knowledge base contains hundreds of detailed and up-to-date articles aimed at getting customers the information they need with the minimum of fuss. Now you're ready to make and receive calls. It's that easy! Do I Get Any Savings if I Call Long Distance? If the country you want to call is not on the plan, don’t worry. We offer very low rates to almost every country in the world. Use the interactive tools below to find the rates to the countries you call most often.